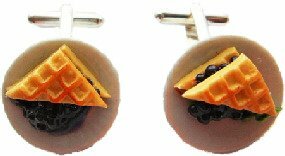 Miniature handcrafted blueberry waffle pie on a plated cufflinks. Made from polymer clay (fimo). Pie is on a ceramic plate.